Brisbane students got a taste of the advanced science technology engineering and maths (STEM) skills they’ll need if they’re considering careers in the technologically advanced resources sector. For the first time, students from St Rita’s College, St Laurence’s College, Kelvin Grove State College and All Hallows Schools took part in Beakers.Bots.Build, run by the Queensland Minerals and Energy Academy (QMEA). St Rita’s hosted the event, which included 60 year-nine students and five teachers. They learned to program robots, try their hands at minerals extraction and design a device to launch coins into the air. 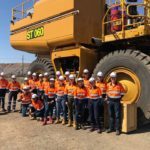 “We are very proud to support this outstanding program, and the results speak for themselves,” said James Palmer, Asset President of BHP Mitsubishi Alliance. St Rita’s Work-Related Learning teacher Melanie Sax-Wood said the school was excited to be one of the newest QMEA schools and was looking forward to seeing the students join the dots between classroom learning and the practical applications of STEM. 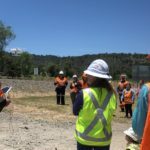 “It’s particularly important for girls to see the vast array of occupations STEM studies can open up and the careers in the resources sector that they might not even have known about,” she said.